Here’s my favorite Filipino dish that I’ve cooked many times which is Pork Afritada. 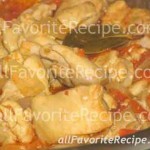 This Filipino recipe is a tomato sauce based stews that are somewhat similar to mechado, menudo and kaldereta recipe. Hope you’ll like this dish and don’t forget to have fun in your cooking. Put pork in a bowl and season with salt and pepper. Let stand 10 to 20 minutes. Heat oil in a skillet over medium heat. Stir-fry pork pieces until no longer pink in color and turn lightly brown. Add and sauté garlic until fragrant. Stir in onion until soft and translucent. Season with patis and then add potatoes, stir-fry for a few minutes. Pour in water and tomato sauce and bring to a boil. 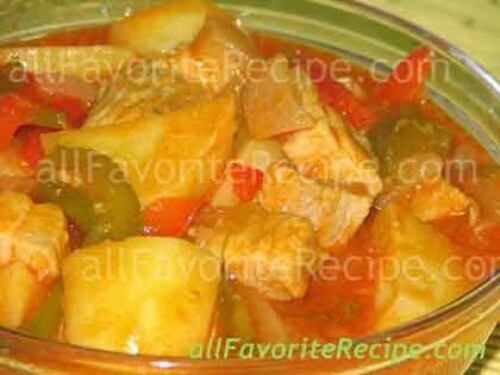 Lower the heat and let it simmer covered for about 25 to 30 minutes or until pork is cooked and potatoes are tender. Add in bell peppers and stir to blend. Correct seasonings. Thicken sauce with breadcrumbs (or flour, or cornstarch, if using). Stir and blend and let simmer for another few more minutes. Remove from heat. Transfer to a serving dish and serve hot. Pork afritada for dinner! Hope my dad will love this..
Hi, thank you for this recipe. Since back home in the philippines I didn’t know how to cook. Now I followed your recipe and I found out this 2 tbsp constarch is too thick in consistency so my afritada is like pudding. However, it taste so good. Thanks, I’ll be serving this to our town fiesta…. i will try this recipe tonight. i think i can do this. This will be my first time preparing pork afritada. Hope my family will like this. YUM YUM YUM I REALLY LIKE IT I SO HUNGRY NA!!!!!!!!!!!!!!!!!!!!!!!! Hi! I’ve tried your dish and everyone loves it. And the funny thing was, it was my first time to cook Pork Afritada. It was very fulfilling. Thanks and Happy New Year! i love your recipe! it taste so good and easy to prepare..
thanks for your afritada.. taste great my family loves it when I cooked it. thanks more power and more recipes to come. yay! thanks for sharing this recipe..I am hosting a dinner for my Japanese friends tomorrow and I’m cooking pork aftritada and chicken menudo. I’m sure they’ll love it! thanks! hi, you’re afritada is easy to prepare and cook it taste so good. My family will surely love it again. Youre site ismy favorite i cook all Filipino food here in Florida we just migrated here and my hub missed all Filipino food. His favorite is saute monggo. Thank you for guiding us and being my partner in my kitchen. Hello, Thanks much for your Afritada, i cooked it for my host family here in geneva @ they love it.. more recipe to come! !God bless! 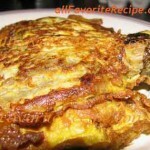 thanks for creating this pinoy recipe site…..